A road-rage incident between a Camaro and a pickup truck on the New York State Thruway led to a big crash near Batavia New York. YouTuber Tim Linton, who had just installed a dash-cam on his vehicle the previous day, captured the incident on film. From what we understand, it all started at the 35-second mark when the fifth-gen Camaro driver tried to squeeze in front of the truck from the right lane. 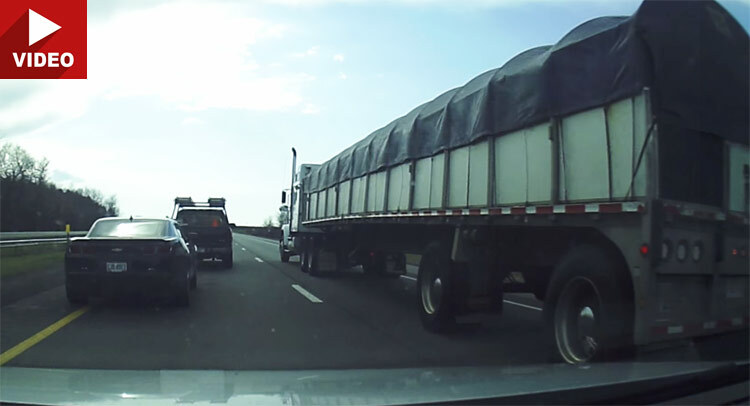 Instead of just slowing down, the pickup accelerated and the two drivers started bickering on the road.The Camaro driver tailgated the pickup, and the pickup driver responded by riding right next to the large truck on the right hand side blocking the other motorist’s way. Moments later, the Chevy driver tried to overtake the pickup from the left shoulder but he / she lost control and the pickup crashed into it leading all three vehicles off the road. According to Linton, “Nobody [was] hurt”, but the “Camaro tried to get away so drivers were not together after accident. Video turned over to State Police”.